Buy your new office furniture from us and we can take away the old. 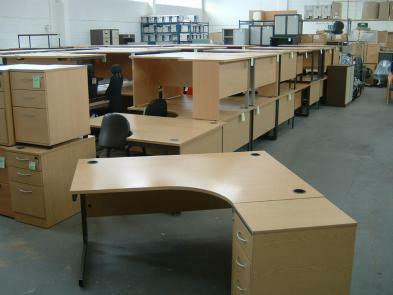 OR if you want to buy some really good quality used office furniture - why not buy recycled! Buy some real office furniture bargains - some furniture is so good, it looks new! What is the office furniture recycling project? 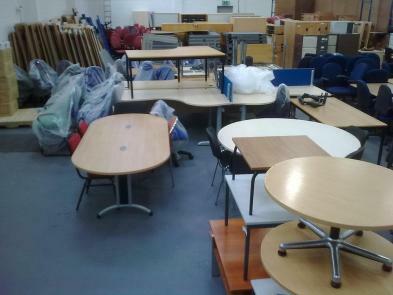 We clear out old and unused items of office furniture like desks, chairs and filing cabinets. Often when delivering new. A van can deliver your new office furniture and instead of returning empty - we take away the old. It helps you and the environment. Local delivery and collection to Bridgwater, Taunton, Exeter, Yeovil, Street, Shepton Mallet, Weston. National service available. We separate and stream for recycling any items that are at the end of their useful life and try to keep this to a minimum and save land fill. This year we recycled over 88% of old furniture. We have our own dedicated warehouse and workshop area to do this. Recycled Office Furniture Bargains always available. Are you a charity and need some office furniture? In the early part of 2009 we realised that our success in supplying whole floors of new furniture to large organisations, including local authorities, left a growing problem of disposing of the old furniture. Much of it was being sent to landfill and we found this unacceptable. We saw it as part of the responsibility of supplying new furniture to make better provision for removing and recycling office furniture in a much more environmentally friendly way. We set about expanding to a 7000 sq ft facility from which we can offer the service. You get a collection certificate proving responsible disposal. When you are purchasing new office furniture, we will endeavour to offer this service at no charge but this will depend on a survey of your old furniture. There may be a charge for recycling office furniture depending on what it is and how much you have. Each job is assessed individually and you will need to contact us for a quote. Some items can be collected free of charge, if they can be refurbished and re-used. What furniture can be recycled? Items we may be able to recycle for no charge when delivering new.